Or end the shift. Been there, done that, got the poster. Well, we got ’em. 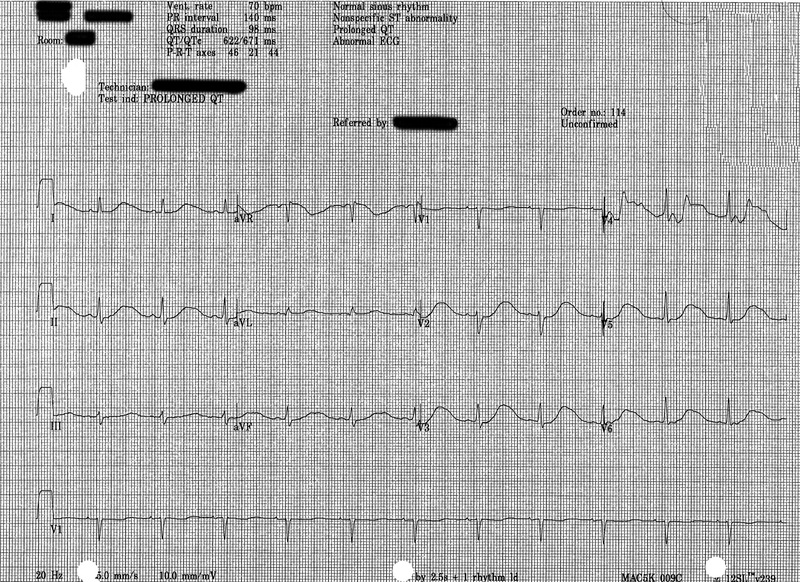 Last week I posted an EKG quizzer. Funny looking 12-lead right? Prolonged QT? Dilaudid, Verapamil? Remember? No? Go check the link to refresh your memory: Friday 12-Lead. OK, so we have signifcant QT prolongation. Or do we? Is it me or does that T-Wave look kind of funny? Kinda’ looks a little flat-ish. Hmm…I see a little bit of notching in the T-waves here. Almost like this isn’t just the T-wave we’re looking at. Maybe this will help a little bit: the patient’s potassium level when drawn was *drum roll please* 1.9mEq/L. Yes, 1.9mEq/L. She had gotten some replacement during the days, but obviously it was not enough. What we have here is actually a QU segment as the U-wave from the hypokalemia has merged into the normal T-wave. More examples of this can be seen thanks to Google’s Book Search from Understanding Electrocardiography. 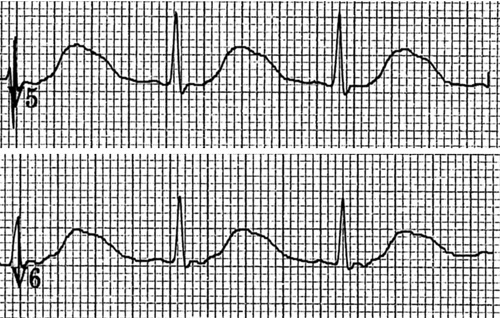 It notes that you start to see dominant U-waves that merge with the T-wave when serum levels of potassium below 3.omEq/L, most notable in leads V2-V6 (as shown above), with the U-waves actually becoming larger than the T-waves when the levels drop to around 1.0mEq/L. Adverse events related to hypokalemia include AV blocks, torsades, V-Fib and cardiac arrest, which is not a surprise knowing how potassium works in the cardiac cycle. Typical causes of hypokalemia include diuretic use, alcohol abuse, loss through the GI tract from vomiting or suction (think NG tube) and some antibiotics just to give short list. Electrolyte imbalances are also relatively common with pancreatitis, especially when you have vomiting. Our patient was pretty much past the vomiting stage having been NPO for 3 days. Combine that with having NS going at 250ml/hr for the last 2 days and we were flushing her K+ out of the system. Fluids were changed to add K and the rate was reduced. She got several K+ riders during day shift as well. Thankfully the on-call doc didn’t freak out and have us turn the dilaudid PCA off as that would have caused just a bit of a problem based on her usage. Even better was we never had to talk to the EP doc. Small things. By the time I came back that night, her potassium was edging up to around 3.5 and her QT had normalized out to around 420ms. We get so tuned in to hyperkalemia that sometimes we forget that hypokalemia is just as significant. We were able to keep the potassium within normal for the rest of the stay and to no surprise, her QT intervals stayed normal and there was no recurrence of giant U-waves. One of our EP docs has been doing a roaring business in bivent pacers lately. Between upgrades to existing pacemakers and new bivents we’ve been seeing these frequently. On top of that, when we moved, our telemetry provider upgraded our system and software so we could actually see bivent pacing. I figured that a quick primer on bivents was in order. What is a biventricular pacemaker anyway? It is what it says. There is a lead in each ventricle, pacing each ventricle. Historically, pacemakers have been one sided only, usually the right ventricle (RV) and/or right atrium (RA) due to ease of access. You pop into the venous system, float a wire into the right side and you’re good to go. The difficulty ramped up in reaching the left ventricle (LV) generally, the veins of the coronary sinus are harder to access and of a smaller caliber. Thanks to advances in catheter size and mobility, this has gotten easier. But why do this? In heart failure, espcially dilated cardiomypoathy, the dilation of the heart makes the ventricles, well, floppy. They get big and stretched out and consequently the condution system gets stretched out as well. What begins to happen is that the RV and LV start beating out of time (or asynchronously), which in the end makes the heart work harder to achieve the output needed. The harder workig heart stretches more, which make it work harder to maintain output and on and on down the spiral. Cardiac resynchronization therapy (CRT) with the use of bivent pacing enables the heart to start beating in time once gain. I know that I’ve way oversimplified this, but I’m going for core concepts here. But talking about CRT allows me to post up some great strips that I’ve picked up to demonstrate visually what is happening. Looking closely, you notice a couple of things. This is both a bivent and a dual chamber pacer. Notice the spikes before the P wave and then the double spikes leading into the QRS complex. We’re able to see both the RV and LV leads firing. So instead of having only 1 lead firing in the RV and having the conduction impulse cross via cell-to-cell contact, each side of the heart is being paced, thereby getting better contractility and a better ejection fraction (EF). I changed the tracing speed to 50mm/s to better illustrate the 2 separate ventricular spikes. Yes, there are risks, there are patients this doesn’t work for and the cost is pretty steep (I’ve heard in the range of $45,000 for the device alone…) but it appears to do what it is intended to do. arrhythmia, atrial fibrillation, EKG, It's Nursing! “Do you feel OK?” I ask as I’m slapping a BP cuff around his arm. “Not dizzy, light-headed?” I press. “Nope, nothings changed from when you were here last.” he says as the BP pops up 144/72. “Your heart rate dipped into the 20’s and hung there for awhile, that’s all.” I reply. Here’s the funny thing though: he had been doing this for days. No problems with the low pulse at all. Peeing fine. No light-headedness, dizziness, auras or any other weird lack-of-perfusing the brain problems. Only problem was when he moved about too much, he turned a lovely shade of eggplant purple. 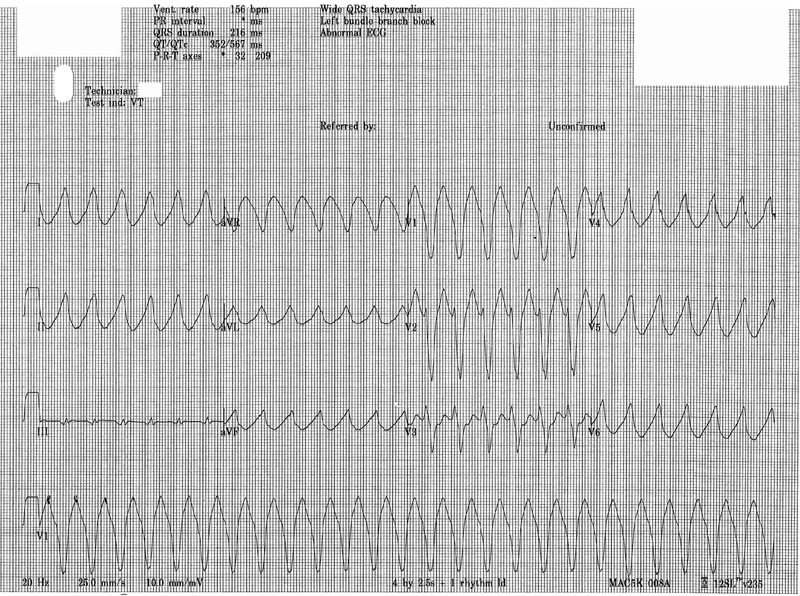 Telemetry was showingwhat appeared to be a slow atrial fibrillation, but with his size, it would not have surprised me it if was a combination of junctional and ventricular escape rather than the a-fib due to the morphology of the QRS complexes. 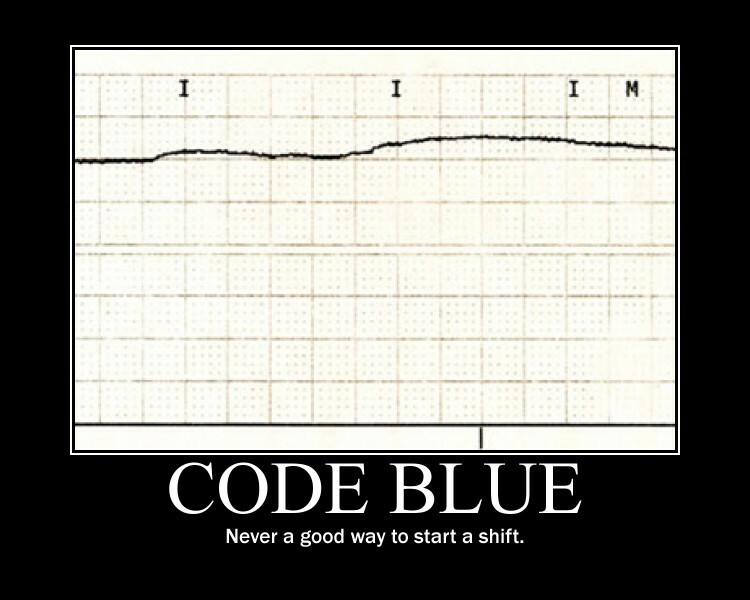 Even with that in mind though, it could have been a-fib with a bundle branch block. Then by luck, the morning before he was going to get a pacemaker the tele tech and I were chatting and examining his rhythm when we were able to get this shot. It starts with a PVC, then a sinus beat and another PVC. Then it starts to get funky. The deflection of the QRS complexes shift in every lead except the V-Lead, flipping opposite from what they had been doing. There wasn’t slowing of the rate that could be coupled to this flip as he had gone lower several times during the night and his strips hadn’t changed like this. Looking back through, we noticed that he had been doing this all along, but had never captured it on paper. So why question becomes: what the hell is going on here? 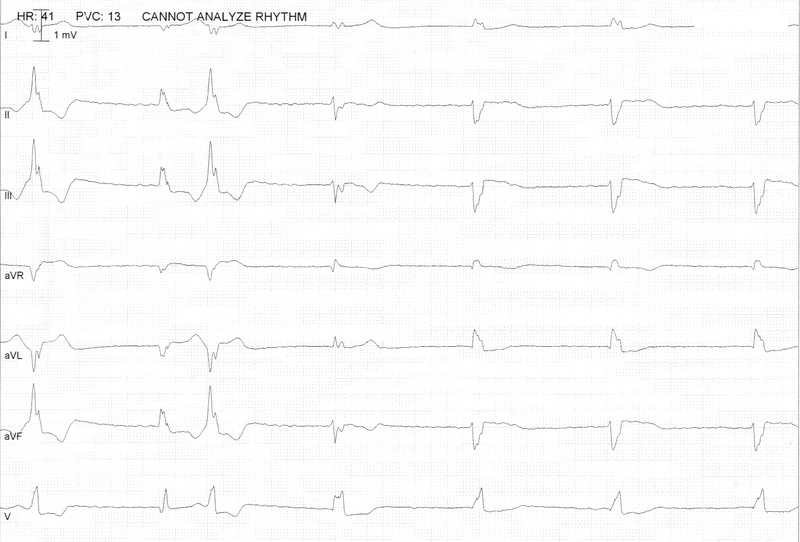 Am I looking at a junctional/ventricular escape type of rhythm? Or an intermittent right/left bundle? And what could be causing this transient shift in axis, especially with no complaints from the patient? And for what it’s worth, he got a pacer and looked much, much better the next day. But I’m still baffled. Any help?